Glaucus harvests the defenses of its prey and uses them against its own predators. We originally posted this episode at the New York Times, where you can read more. Produced by Lauren Cheung. The Glaucus illustration is based on the beautiful photo by Taro Taylor. The music is “Thinking of you” by Gillicuddy. Hiding from danger in the deep sea is a very different game than hiding from danger on land. In the sea, not only does a creature have nothing to hide behind, it can’t even camouflage itself, because it’s environment is just clear water. Perhaps not surprisingly, then, many animals of the sea have evolved ways of being transparent. Here is a semi-interactive video (with the option of a single, non-interactive video here) from CreatureCast alum Sophia Tintori, featuring tips from a handful of ocean-dwellers that each have drastically different approaches to being invisible. Score by Amil Byleckie, video made by Sophia Tintori, with a big thanks to Sönke Johnsen. Funding provided by Duke University Provost & Council for the Arts and the Office of Graduate Education at the University of North Carolina Chapel Hill. Released under a Creative Commons Attribution-Non Commercial-Share Alike license. If you have ever been stung by a jellyfish or coral you’ve already encountered one of these – a nematocyst. It is the stinging capsule found within specialized cells of Cnidaria. Nematocysts have poison filled harpoons that rapidly fire to attach to and incapacitate prey, or to deter predators. 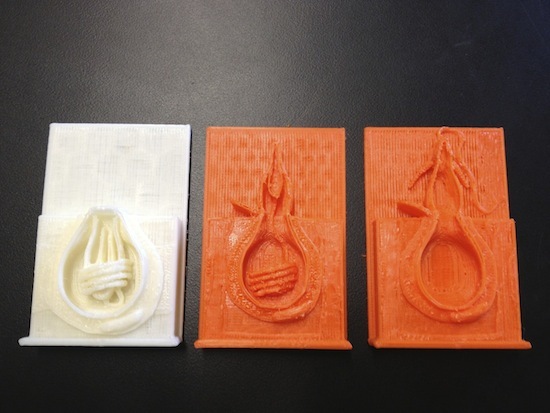 This 3D model, available for download at Thingiverse if you would like to print it yourself, is an homage to anatomical relief models that probably adorned your doctors office and junior high science classroom. It shows the nematocyst in three stages of discharge. First, the inverted harpoon is packed within the capsule. The harpoon is inside-out at this point. 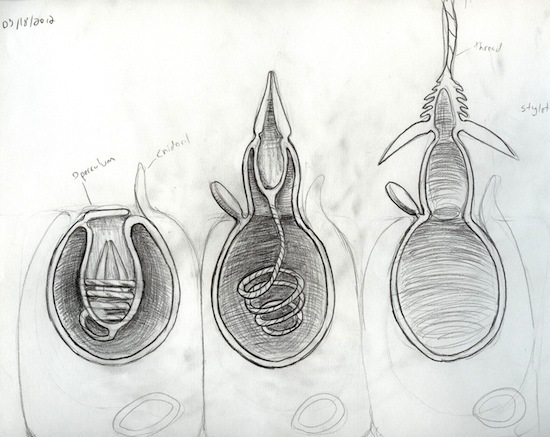 Second, a stimulus has led the capsule to pressurize, swinging open the operculum (the trap door at the top), and begin everting the poison filled thread. As it extends, it turns right-sideout, exposing hooked barbs as it goes. Third, the thread is fully extended. At this point, it would be lodged in the flesh of whatever brushed up against it. This model was designed by Daniel Newman, a certificate student in the Natural Science Illustration program at the Rhode Island School of Design, while doing an internship facilitated by Amy Bartlet Wright in my lab. His original concept sketches can be viewed above, along with the printed models. Thanks to Stefan Siebert and Bryn Bliska.